Birthplace : Bridgeport, Connecticut, U.S. The American physicist, inventor and manufacturer Edwin Herbert Land (1909-1991) was the first to develop successfully a synthetic light-polarizing material and to develop a camera for one-step photography. 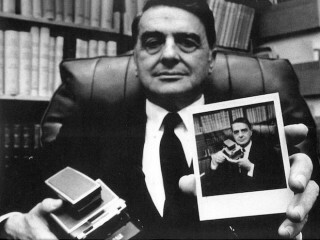 Edwin Land was born in Bridgeport, Connecticut in 1909. After attending preparatory school he entered Harvard University. He soon became involved in studying polarized light and began experiments to develop a way of creating the effect artificially. In normal light, wave vibrations take place in all directions; in polarized light, these vibrations are controlled and permitted to travel only in certain directions. In 1828 a prism had been invented that was used to polarize light for optical instruments. The great expense of the prism, however, limited its use, and a search was begun for a cheaper means of creating the same effect; most attempts had concentrated on trying to grow very large crystals in the laboratory. Land, deciding to leave college to pursue his work at a laboratory in New York City, approached the problem by using many small crystals tightly packed together to produce the effect of one large crystal. His technique was to extrude plastic containing the artificial crystals through small holes, thus ensuring that the crystals would all be lying in the proper direction. For much of his early career, Land worked alone. While working in New York, however, he met Helen Maislen, a graduate of Smith College who became his assistant and, in 1929, his wife. In that year, he returned to Harvard, where the university provided him with laboratory space for his research. Land discussed his work with George W. Wheel-wright III, a physics instructor at Harvard who had been one of his teachers. In 1932 Wheelwright left teaching to work with Land, and together the two men opened a consulting physics laboratory and continued to perfect their polarizer. In 1937 Land organized the Polaroid Corporation, which is today the leading firm in the field. Land's inventive ability was matched by a shrewd business sense. Part of his success was due to the fact that he licensed his method for various applications: to the American Optical Company for sunglasses, to the Eastman Kodak Company for camera filters, and to Bausch and Lomb Company for optical instruments. During World War II, Land worked on optics and missiles for the National Defense Research Committee. In 1847 he invented the Polaroid Land camera, which made possible one-step photography. In 1948 he received the coveted Holley Medal of the American Society of Mechanical Engineers. In that same year, he developed a new optical system that enabled scientists at the Sloan-Kettering Institute to observe living human cells in their natural color. During the 1950s, Land served as head of a presidential committee studying ways to prevent future sneak attacks on the United States like the one that occurred at Pearl Harbor. Land's Polaroid Corporation continued research in optics generally and in color vision, plastics, and other fields. Crowning achievements of Land's career came in 1963, when he was awarded the Presidential Medal of Freedom, and in 1967, when he received the National Medal of Science, both presented by President Lyndon Johnson. In 1972, Land was able to see a long-held dream of his become a reality when he introduced the SX-70 instant color camera to the world. Land was granted 533 patents for his inventions, and in 1977, the U.S. Patent Office inducted him into the Inventor's Hall of Fame. In August of 1982, Land retired. On March 1, 1991, he died of undisclosed causes at the age of 81. In an age increasingly characterized by the displacement of individual inventors by large industrial research laboratories, Land's career indicates that individuals can still make contributions to technological progress. View the full website biography of Edwin Land.